A Vietnamese teacher has spent the past 12 years far away from her own kids and hometown so that she can educate ethnic minority youth in a mountainous commune on the China-Vietnam border. 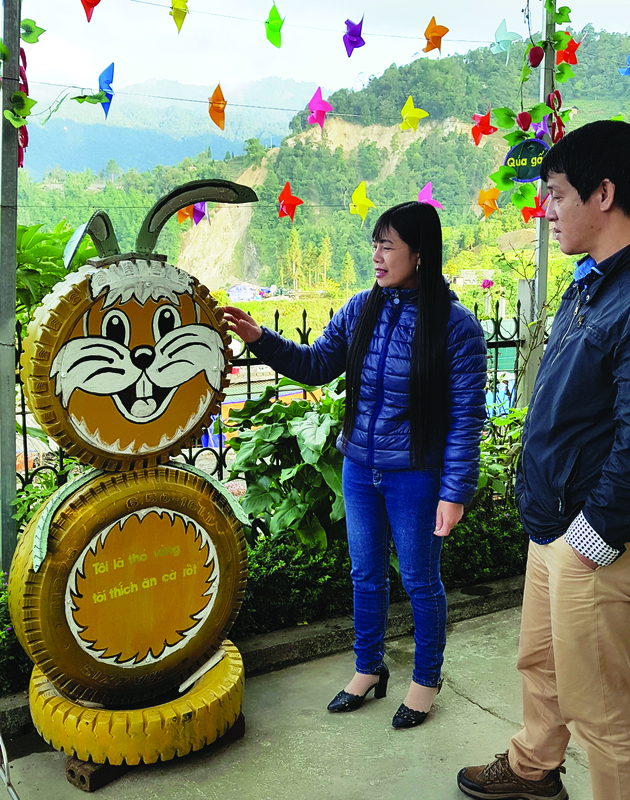 Pham Bach Ngoc, principal of Si Lo Lau Kindergarten in the namesake commune in Phong Tho District, Lai Chau Province, shared her story with Tuoi Tre (Youth) newspaper inside her small home 1,600 meters above sea level in the mountains of Lai Chau. For 22 years, Ngoc has dedicated her life to educating kindergarteners. The wife and mother of two began her career in her family’s hometown of Kim Son District, Ninh Binh Province. In Vietnam, teachers do their best to be included in the government’s official payroll, rather than receive payment under the table, in order to ensure a stable life for them and their family. “It was really difficult for me to be on the government's payroll in Ninh Binh back then, while my husband and I really needed a steady income to support our family,” Ngoc shared. In 2006, when Ngoc’s children were in eighth and tenth grade, she decided it was time to seek out a more secure way to earn a living and soon found herself searching for employment in Lai Chau Province, about 520 kilometers northwest of Ninh Binh. Lai Chau was still a remote mountainous locality back then and Ngoc was sure her degrees and experience were enough to guarantee her a spot on the government’s payroll, even if it meant accepting a job far from the province’s center. Phung Dinh Thao, head of the Office of Education and Training in Phong Tho District at the time, shared that he did offer Ngoc a few positions near the provincial center, but she insisted she did not mind working in border areas where life was much harsher. In the end, Ngoc and her husband accepted jobs in Si Lo Lau Commune, a small village on the border of Vietnam and China. What started out as chasing the dream of a simple and stable life eventually turned into something much bigger for Ngoc. After arriving in the locality, Ngoc began work at a local kindergarten, while her husband served as an accountant at a middle school near the commune’s center. Both were constantly busy with work and could only be together on the weekends, but that was all they needed. 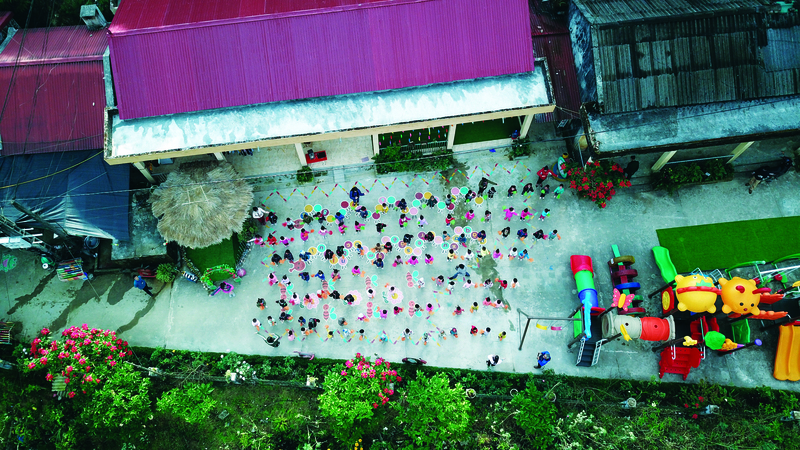 Si Lo Lau Kindergarten, where Ngoc worked, only had about 100 students at the time, and only a few of those were able to regularly attend school due to difficult living conditions in the area. Life was also hard for the couple, and all they could do was encourage each other. The couple’s first winter in the border commune was so excruciating that Ngoc even admitted that there were times she thought of quitting and returning to Ninh Binh without a job just to be with her children in the family’s cozy home. “But I had to think about my family and those who trusted me with the job,” Ngoc asserted. And so Ngoc stayed. Her hard work paid off and she was appointed as vice-principal of the Si Lo Lau Kindergarten the following year. In 2012, she was once again promoted, this time to principal. Ngoc was not shy to admit the challenges she’s faced to reach success in her career. Most of the people in Si Lo Lau Commune are of the Mong and Dao ethnic minorities and are not fluent in standard Vietnamese. In order to teach the local youths, Ngoc first had to find a way to break down the language barrier. She attempted several different methods to teach them Vietnamese, but she just could not seem to find a way to help the kids remember their lessons. Eventually she decided to try attaching all of the student’s lessons to different aspects of their daily activities. And it worked. One method she was particularly proud of is the ‘recycling zoo’ – a play area filled with toy animals crafted from old tires and other used objects. The names of each animal in the ‘zoo’ are written in Vietnamese so the children play and learn at the same time. Aside from her time in class, Ngoc also spent her free time assisting local residents in their chores and encouraging them to take their children to school. 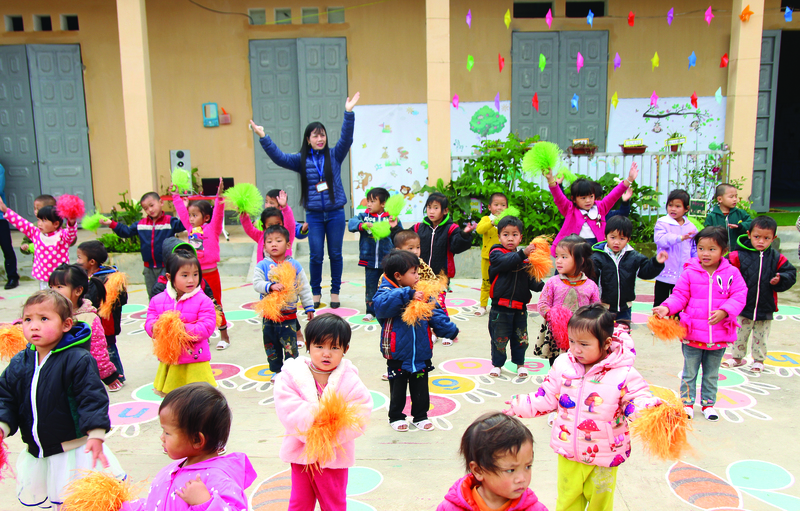 As temperature in Si Lo Lau plummet to less than five degrees Celsius in the winter, Ngoc often found herself calling on friends and relatives in her hometown to raise funds and donate warm clothes and blankets for the kids. She also collects wood to build bonfire and keep her class warm. Thanks to her relentless dedication, Ngoc has not only overcome the challenges of educating young minds in such a harsh environment, but also found love – she truly cares for the local people and is overwhelmed by the trust and admiration they have for her. Ngoc’s life, however, took a turn for the worse in 2015. Her eldest son was granted a scholarship to study in Japan that year, and paid a visit to Si Lo Lau before he left. While her husband and son were on a motorbike tour in the commune, they wound up in a serious traffic accident. Her husband suffered severe brain damage and became paralyzed. One year later, the family brought the husband to Hanoi for further treatment, with Ngoc paying him a visit every weekend. Ngoc’s beloved husband passed away two years after he was transferred to Hanoi. Her children had already settled down in the capital by then and wanted her to live with them, as it was their turn to take care of her. But it was not the time for Ngoc to say farewell to her second home. She was not ready, and neither were the people in Si Lo Lau. “Even when my family had serious troubles, I never left this place. I will keep staying and working here, at least until I retire,” she remarked.